Last year, we published two volumes of GAMESbrief Unplugged – curated, edited and reorganised collections of the best of GAMESbrief. As well as being useful for reference, reorganising the content to follow the development of key stories and events makes for compelling reading for anyone with an interest in the business of games. It’s fascinating to go back and read through chronological accounts of how events like the shutting down of APB and RealTime Worlds, or the campaign for games tax credits, actually unfolded. Great reads for the dark winter evenings, then – and for the next few days, our self-publishing provider, Lulu, is offering 25% off all purchases, so this is a perfect time to add GAMESbrief Unplugged to your bookshelf. 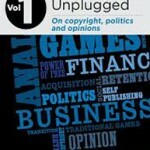 You can order GAMESbrief Unplugged from our book store – [Volume 1] [Volume 2]. Just enter the code LULUBOOKUK305 to activate your 25% discount. The coupon expires on January 31st (that’s next Tuesday), and there’s a maximum saving of £50, although since each book only costs £8.97 ($14) even before the discount, that shouldn’t be a problem. Happy reading!